The Make it Right foundation was founded in 2007 by Brad Pitt as an architectural response to the devastation wrought by Hurricane Katrina. Rather than merely replicating the homes destroyed by the storm, MIR set out to build affordable housing that incorporated sophisticated and resilient architecture and sustainable building practices, making their structures both LEED Platinum certified as well as using many Cradle to Cradle materials. They didn’t just want to replace–they wanted to upgrade. 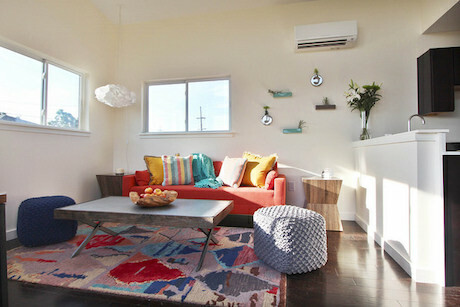 Recently, MIR dabbled in tiny houses, building a smartly designed 430 sq ft home in New Orleans. 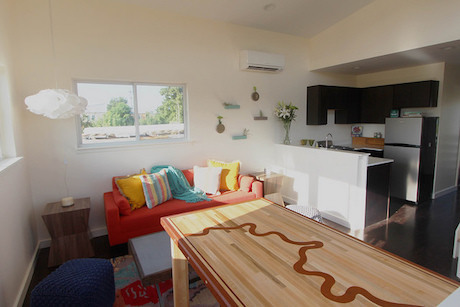 Working with the TV Show Tiny House Nation, MIR designed and built the home in a mere 21 days. The simple little house includes a full kitchen, a living area, sleeping loft and a washer/dryer. 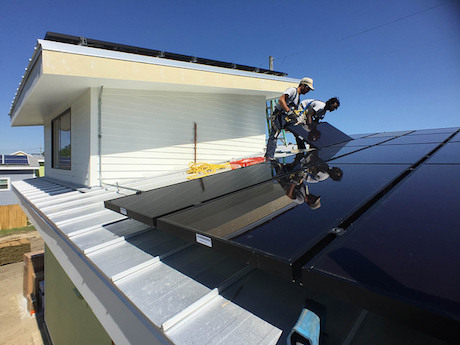 The place has a number of features to improve efficiency such a solar array that delivers all of the home’s power, a mini-split HVAC system, an abundance of high performance Marvin fiberglass windows and doors and insulation made of discarded American Eagle jeans. They used a number of C2C products as well such as Shaw Floors engineered flooring and Eco by Cosentino stone in the kitchen (same stuff we used in the LifeEdited Apartment incidentally). The understated interior was designed by Nomita Joshi Gupta of Spruce NOLA, all made with sustainable wood and natural fibers and dyes. While MIR doesn’t mention the cost of the construction on their site, the organization’s raison d’être is building sustainable, affordable housing and we suspect this house is no different. Because building small means fewer materials to source, often you can upgrade on materials and design without breaking the bank, achieving the mostly unheard of combination of low price and high quality. I get this as a proof of concept, but I wish someone would design something that would suit the needs of the majority of families at a price they can afford. That’s the real mark of sustainability. New Orleans is a fairly temperate city. “high performance Marvin fiberglass windows” only seem reasonable for someone with the pocket book of Brad Pitt. 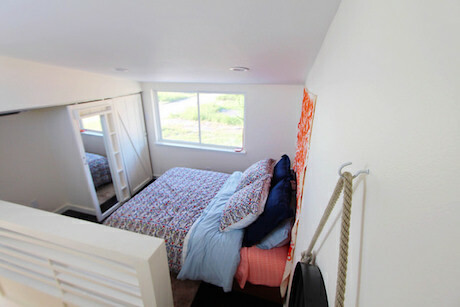 Also, that loft is inaccessible to people with disabilities and adds a separate roof, which increases costs. To be cost and energy efficient, you must minimize exterior surface, which means 1 roof and no rooms jutting out from the building. For every lucky family that gets a home like this, there is another family that wishes the architects would have taken more than 21 days to design this and built 2 houses with the money that went into this one.